I'm a little bit late to the dinner table with this particular review; I admit, when I first received a copy of this book I was somewhat underwhelmed. Mr Wigg has the outward appearance of being a particularly beautiful book, but the blurb failed to engage me. "It's a lot of work for an old man with shaking hands, but he'll give it a go, as he always has," teases the blurb, and I immediately thought that was all well and good but not really for me. To quote a young lady I know "Cool story, bro- needs more dragons." Then, last week, I met Inga Simpson. To put it very plainly, I don't think I would have read this book if I hadn't met Inga. She is the best possible marketing resource for her work because she is funny, and warm, and generous with her time. In short, she must be a publisher's dream to work with. 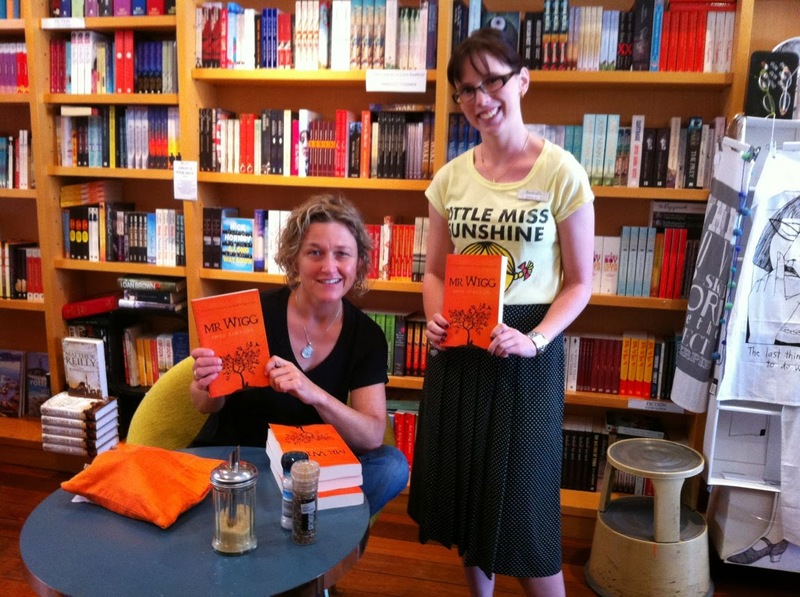 While Inga was in the store (Bookcaffe Swanbourne), the time passed quickly (too quickly) as we talked about the publishing industry, what makes a great bookstore, and books we have read and loved. So, that night I went home and read Mr Wigg. The book is set in the summer of 1971 on what is left of a family farm in the fruit growing district of New South Wales. Mr Wigg is a man in his eighties and for various reasons he's had to sell his farm land- which is just as well because he wasn't really very good at it. His passion is growing fruit. Mr Wigg spends his days listening to the bickering of his fruit trees, and watching the seasons pass with the growing and flowering of different flavours. He cooks a myriad of delicious pies and jams with his grandchildren, all the while telling them a fable about The Peach King. This is a character driven novel. People have said to me, since I finished it, that they cannot believe I liked it- nothing happened! Perhaps these people were not paying close enough attention. Things happened, but the most important aspect of the book was that we got to know Mr Wigg, who is a wonderful, rich character who feels so real I am still not entirely convinced he will not walk into the store. Simpson is an accomplished writer with a style that is gentle and decorative without being overwritten. As a result, this is a book with a wide appeal. There is something for almost everyone, young, old and in-between. It contains meditation on aging, gender and the Australian psyche, racism in the cricketing world at the time, the nature of inheritance in rural families, an Anti-Vietnam message, an examination of grief and a consideration of the role of art and creativity, and who has access to it. To those people who have said they found the novel dull, this begs the question "Were you paying attention?" To sum up: this novel is the perfect remedy for the hustle and bustle of modern life. Slow down, sit back and get ready to crave peaches. I give Mr Wigg by Inga Simpson 4 out of 5 stars.